If I say these tomatoes are from my own garden most of you will praise me for the good work…but am deeply ashamed to write even the word ‘my garden’. If you come to my home right now you will see a big bad mess in the front yard. The garden which I used to be proud over is now a mini jungle. The continuous rain in the past few months (or almost the whole year) has played havoc and most of the plants have withered. The tomato and brinjal plants which were giving me enormous produce the whole year have rotten. But the fact is I cant blame only rain as due to some problems in the past month I also could not take proper care of them. We don’t have any gardener and don’t even know where to find one (blame on my limited knowledge of the local language). Add to that a supremely active baby, who will come running after me if I try to do any work there, the scariest part is his TLC...trust me he even tries to hug the plants and kisses the flowers with a loud 'hamma'. But as everyone says animals and plants are the most generous living beings...inspite of all our ignorance they are still giving us bounty of vegetables. The single cherry tomato bush (nobody believes its one plant) is giving me atleast 12-15 fruits almost everyday. There's still a lot of malabar spinach, radish and ladies finger in the garden. We have stopped buying spring onions and spinach as there's more than we three can actually eat. But they are nestled in a jungle of weeds...you will have to go and look for them. I made this tart on the Seventh day (Saptomi) of puja as a snack with coffee before going for the pandal hopping. Hubby simply loved eating this and so our friends. I followed the recipe shown by Rachel Allen on 'Bake'. I found this show very helpful and planning to buy this book as well. This pie crust is also homemade and trust me when I say it tastes better than its shop bought counterparts. Very crumbly and soft. First make the shortcrust pastry dough. For this sift the flour, salt, pepper powder in a big bowl. To this add the chilled and cubed butter. With your fingertip start rubbing the butter and flour softly to make it coarse bread crumb like. This is a very important step to make the pastry flaky as when the pastry would be baked the butter will melt leaving small air pockets to give it a light texture..Dont use your hand or put too much pressure as that will melt the butter. Break the egg and whip it to make smooth. Start adding little at a time just to bring the dough together. The moisture should be just enough to gather it. Take this in a cling film, pat it flat (3/4” or so), wrap and chill in fridge for atleast an hour. Once you are ready to bake preheat the oven at 170 C.
Take out the dough. Spread the cling film on a clean work surface and place the dough on it. Cover with another big piece of cling film. Roll the dough out in a circle. Once done remove the upper cling film layer. With the help of the bottom cling film hold the rolled sheet in hand and place on the tart case. Line it properly and remove the excess by pressing gently on the edges. Pour kidney or any other beans in the lined case and blind bake for 15-20 minutes till the pastry fills dry to touch. Remove the beans and bake for another couple of minutes . While the pastry case is baking prepare the filling. Start by beating the eggs till smooth (I added the leftover egg from the dough to this as well). Mix in the milk and the cream. Beat and mix in the grated cheese and lemon zest. Season with salt and pepper and keep aside. Once the pastry case is baked line the bottom with sliced potato. Pour the egg-cream batter. Place the sliced tomatoes on top. Sprikle chopped olives, oregano and chilli flakes. Bake for 35-40 minutes or till the top is golden and a toothpick inserted in the center comes out clean. Serve after 10-15 minutes with Coffee. Rachel has a great spinach and goat's cheese tart recipe Here. The pastry can be baked a day before in advance and chilled. To get a perfect shape make sure to fill the lined case with beans till the edge. Tart, pie, shortcrust pastry, never fail shortcrust pastry recipe, best ever tart case recipe, savory pie, egg in tart, spicy tart, perfect pastry recipe, peppery tart, lemony tart, salted tart dough, basic tart dough recipe, bake, oregano, italian, rustic italian, easy tart, chilli flake and tomato, olive and tomato, how to make shortcrust pastry at home, step by step pastry recipe, easiest pastry dough, how to line tartcase, egg and cream, peppery egg. Thats a beautiful looking tart...love the toppings...have to try it out soon....saving it! Beautiful tart and made with home grown tomatoes as well, simply devine. 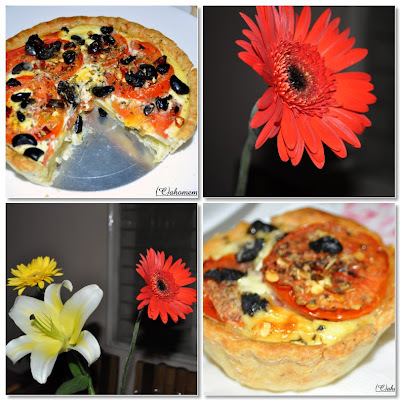 Tart looks simply fabulous..would love to have a slice rite now..
Beautiful tomato tart. Savory tart are my favorite. love the bright colours in there,looks superb and perfectly done.. Wonderful tart..love the topping,looks superb. That is a cute looking Tart ..... Anything home grown is a treat ! Hi Sayantani..lovely tart that is...and am glad to hear you follow Rachel Allen's show as well. I follow her as well...just watched her Christmas Bake shows..loved them and plan to replicate her recipes soon. they look eye catching and vibrant :) and thanks for stopping by my blog and for ur kind words of appreciation. Hi Sayantani...I dont know why my comment came up as Anonymous...anyways loved your tart and am glad that you follow Rachel Allen too!! Yum, your tomato tarts sound delicious and the little one are very cute!! Perfect snack! The tart look crisp and delicious. Very nice snack Sayantani!Looks really good. This tart looks fresh and wonderful.Its all the more special coz its with fresh, organic homegrown tomatoes. Such a beautiful looking tomato tart..all my favorite components in there..looks very refreshing! yummy...that tart looks delicious...have to try this...happy to find ur blog...do drop by at my kitchen at cardamom hills :) n i love your fotos! Lucky you to get all those free vegetables even if you neglect them! The tart looks really tasty. I love Rachel Allen too and have been meaning to try one of her tarts, she makes them seem so easy and fool-proof. And u bet, some bakes are best homemade. This looks real yumm.. thanks for this entry! іn a сontest for οne of the higheѕt quality blοgs on the net.